F or over 700 years, glass artisans on the tiny Venetian Island of Murano have created some of the finest hand formed glass art in the world. You don’t become the undisputed home of the finest glassmakers on earth if your heart isn’t in it. What has elevated Murano into a legendary artform is the passion and commitment of the artisans. 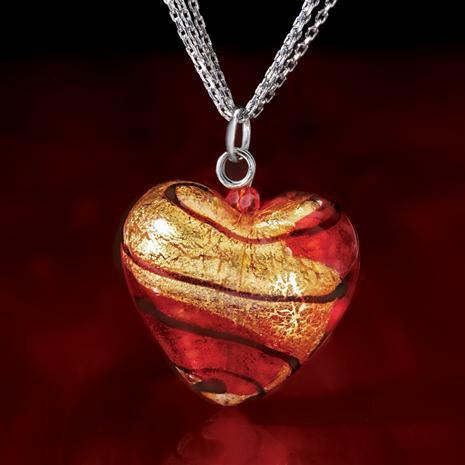 The result of this passion is clearly evident in the Heart of Venice Murano Pendant. Using the aventurine technique (perfected in the 1600s), the artist blends red glass with metallic flakes for a golden yellow shimmer. Every piece is its own work of art and is the perfect way to appreciate the romance and magic of Murano, even when the gondolas are half a world away. There are a lot of Murano imposters out there, so buyer beware. You can rest assured the Murano you get from us is the real deal. We have personally meet the artisans and visit them frequently from our office in Arezzo. As a result, our price and quality of Murano is superlative to what’s in the marketplace. Let her know you’re passionate about her with this remarkable jewelry that resonates with heart and soul.